At the American Public Health Association meeting last month, CUNY SPH doctoral candidate Pamela Vossenas accepted the Tony Mazzocchi Award for Grassroots Activism from the Occupational Health and Safety Section on behalf of UNITE HERE, a labor union representing service workers across the US and Canada, for the passing of a law to prevent injuries to hotel housekeepers. 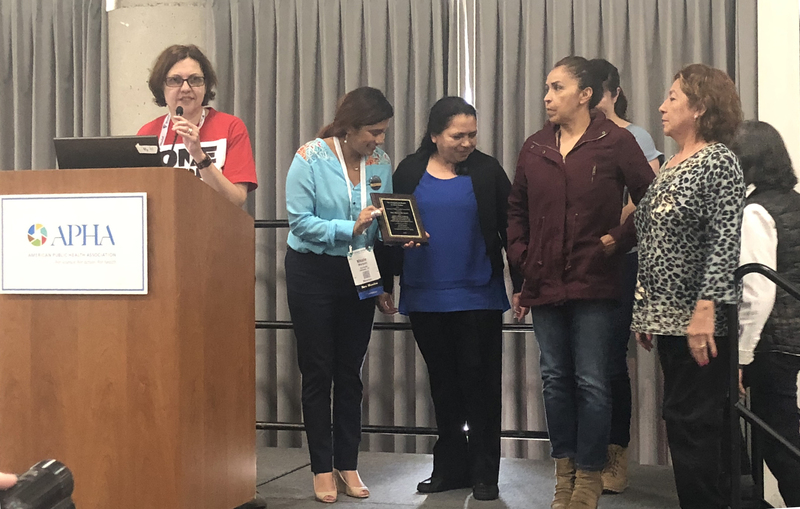 Hotel housekeepers and representatives from UNITE HERE California local unions were also on hand to accept the award that recognized their role. As UNITE HERE’s director of Safety and Health, Vossenas was tasked with coordinating with the local unions to craft the law. After a six-year effort, California Division of Occupational Safety and Health (Cal/OSHA)Title 8, §3345: Hotel Housekeeping Musculoskeletal Injury Prevention, which requires that employers establish an injury prevention plan that involves housekeepers and their union representatives to reduce hazards, took effect on July 1, 2018. “Hotel housekeepers played a key role in the passage of this law,” emphasized Vossenas. Nearly 300 UNITE HERE member housekeepers across the state were part of Cal/OSHA’s process over time with half as many giving testimony.The passage of the law marks the first time that an ergonomics-based standard has been enacted especially for the hospitality industry. It may set a precedent for similar worker safety standards beyond California. Hotel housekeepers are at a disproportionate high risk for musculoskeletal injuries. Vossenas chaired a panel session at the 2018 APHA Meeting with hotel housekeepers, worker advocates and occupational experts sharing their perspectives on the collective efforts that won the law.